After a 12-year run, the last Wrangler JK rolled off Jeep’s Toledo, Ohio assembly line in March 2018. Though the spotlight in the future belongs to the great new Jeep Wrangler JL, there’s still time to buy a rugged, capable, tough, reliable 2018 Jeep Wrangler JK. Refined over the last dozen years, with tens of millions of real-world miles driven by Jeep fans, the 2018 Jeep Wrangler JK is the ultimate expression of the JK, with all the sly gremlins that inevitably plague a new generation already chased down the slain by Jeep engineers. If you want to own the last of the Wrangler JK breed at a lower-than-ever price, we’ve got new 2018 Wrangler JKs on the lot and ready to roll here at McLarty Daniel Chrysler Dodge Jeep Ram Fiat of Springdale. Big and bold, tough and beautiful, the 2018 Jeep Wrangler JK may be the end of that line, but that’s definitely a good thing is you’re looking to buy a 2018 Jeep Wrangler in Springdale. Stop in today, or shop our big selection of JK models online! “If it ain’t broke, don’t fix it” is definitely the motto of Jeep Wrangler designers. While other trucks, cars and SUVs change like the weather, the basic, non-nonsense silhouette of the Jeep Wrangler hasn’t really changed considerably since the first Willys Jeeps first rolled off the line and onto the battlefield back in World War II. Though there was that unfortunate dalliance with rectangular headlights back in the 1990s, the front mug of the 2018 Wrangler JK is a familiar take on the tried-and-true, with the classic seven-slot grille and chrome-trimmed and recessed round headlights. Down below, a bulldog tough bumper with frame mounted towhooks is ready to take on the terrain that would send other 4x4s running home, while composite fenders in either standard or high-top depending on model, can shrug off the thumps and bumps of the trail, while the high ground clearance, short wheelbase and short approach angles let you crawl up and over most any obstacle. 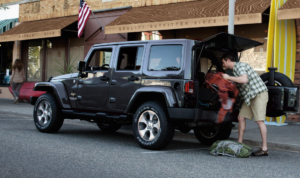 Knowing that Jeep Wrangler owners are lovers of the great outdoors, both the 2018 Wrangler JK four door and two door still feature easy-to-remove doors and a lightweight lift off hardtop or cloth softtop, both available in several styles. If you prefer to keep the doors on, the 2018 Wrangler JK comes with your choice of removable steel half-doors, or full doors with top frames and roll-up windows. Wheel choices on the JK are also up to you, from basic 16 by 7-inch steelies, to bold 18 by 7.5 inch polished alloy. Top and doors on or off, you and your passengers are protected by a full, high-strength steel roll cage and carbon steel body framing with dynamic crumple zones. Under the hood, the powerful and efficient 3.6-liter Pentastar V6 can powwer you through, with 285 hp and 260 lb.-ft. of torque. With over 75 years of legendary 4×4 capability under their belt, There’s a reason the word “Jeep” is nearly synonymous with unstoppable, nearly indestructible off-road performance. The 2018 Wrangler JK is the beneficiary of that long history of Trail Rated dependability. It starts at the ground level, with a choice of locking differentials. Standard is the Trac-Lok limited slip rear differential, which automatically transfers torque to the wheel with the firmest grip on terra firma in slippery conditions. For the ultimate in traction, there’s the amazing Tru-Lok electronic locking diffs, available only on Rubicon models, which balance speed between the left and right side in slippery conditions, maximizing traction. In the bulletproof high-pinion Dana 44 front and rear axles, they’ve got the toughness to get you where you want to go. Other off-road tech grandpa could have only dreamed of for his Jeep is the 2018 Wrangler JK’s available automatic sway-bar disconnect system, which automatically uncouples the front sway bar from the front suspension when driving under 18 mph in 4LO crawl mode, allowing the front wheels to articulate over uneven terrain up to 29 percent further than with the sway bar engaged. It all adds up to incredible 73.1 to 1 crawl ratio that can power you through mud, sand, snow, slush or over even the smoothest rocks with ease. Protecting delicate undercarriage components inthe 2018 Wrangler JK are a full complement of heavy gauge steel skidplates. 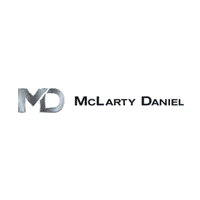 If you’re ready to get into the driver’s seat of a new 2018 Wrangler JK, come see us at McLarty Daniel CDJRF of Springdale. As much as we love the JKs, the have to make way for the long reign of the amazing new Wrangler JL, which means we’re willing to make unbeatable deals to clear the decks for the latest model. Tough, reliable, incredible off-road, with 12 full years of product testing by the toughest testers on earth — Jeep Wrangler owners — the 2018 Jeep Wrangler JK is the Jeep that can take you out past where the streetlights end and adventure truly begins. Stop in today for a test drive, or check out of big selection of 2018 Wrangler JK models online right now.